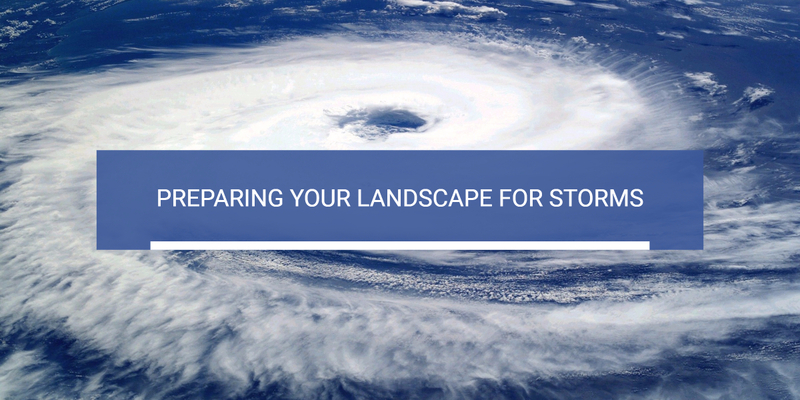 Hurricanes, tropical storms and even normal storms can cause havoc for your Florida landscape. We have been lucky for the past few years, with no major storms making landfall, but even smaller storms can cause damage. Fortunately, there are steps you can take to minimize damage and danger. Some steps need to be taken on a regular basis – not immediately before the storm hits – while others can be taken immediately. Long-term preparation is normal yearly work you would do on your yard, and should not be undertaken immediately before a storm hits. Long-term preparation mainly involves your trees – from making sure you plant the right trees (ones that can withstand storms), to keeping branches trimmed and cutting away dead limbs. You’ll want to talk to a certified arborist for this, as improper pruning can lead to problems down the road, like weak tree trunks or sickly trees. The next major long-term prep area is remedying any ongoing drainage issues. If you have water that doesn’t drain properly during regular rains, it will only get worse during a hurricane or tropical storm. Fix these drainage issues to prevent problems during storms. If you missed out on the long-term prep, there are still a number of things you can do to prepare your yard and minimize damage during a storm. This is not the time for major landscaping projects or yard work. If you have young trees, ensure that they are well-staked. If you previously removed stakes from newly-planted trees, you may consider re-staking them to make sure they stay strong during the storm. The biggest thing to take care of is securing or storing any loose items. Bicycles, trash/recycling bins, hanging or potted plants, lawn furniture…the list goes on and on. If it’s too large to bring inside, secure it to something (or to other items) with heavy-duty rope. If potted plants are too large to move, lay them on their side. Turn tables upside down to and secure them. If it’s loose and in your yard, it has the potential to become a projectile. A common misconception is to place patio furniture in your pool. While this sounds like a good idea, you risk damaging your pool surface. Better to bring items inside or secure tightly. Another idea is to mow your yard before the storm. It might be a week before you’ll be able to cut it again, and it will grow long after all that water. If you have a vegetable garden, harvest everything you can before the storm. If you have fruit trees or palms, try to remove any large fruit or coconuts that could become airborne. Turn off your irrigation system and any other outdoor electrical items. You won’t need to water, and if an irrigation pipe were to break, running your system could cause additional problems. If you have a grill, try to place it somewhere secure or tie it down. If you lose electricity, your grill might come in handy. Finally, make sure any chemicals or fuels – like gas cans and insecticides – are placed somewhere where they will not come in contact with rising waters. Your landscape is amazingly resilient. With proper preparation, your yard and landscaping will be back to beautiful soon after the storm passes through.